An elderly Sheffield woman has been left with life-changing injuries after being knocked over a by a man on a mobility scooter – but her family say police have decided to take no further action. 85-year-old Maureen Bothamley was walking on the pavement near to Eve’s Fruit Stores in Middlewood Road, Hillsborough when the man riding the scooter came from behind and knocked her off her feet. Concerned members of the public called Maureen’s daughter, Lynne Biggin, as they waited for the ambulance to arrive; and she was left horrified when she arrived on the scene a short time later to find her mother lying injured on the ground. 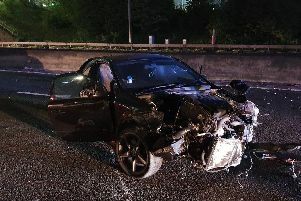 “I don’t know what speed he was doing when he hit her, but everybody there said he was going too fast,” said Lynne, 56. Since the accident on September 13, Maureen had to undergo two major surgeries on her pelvis and right hip. Lynne described how her mother initially failed to show any signs of recovery following her hip surgery, and medics told her family to ‘prepare for the worst’. But thankfully the grandmother-of-six began to make progress, and has now been moved from Northern General to care facility, Westbourne House, where she is undergoing physiotherapy. Lynne says her mother, who used to run the Sportsman Inn on Walkley Bank Road before it was demolished, was a ‘very independent woman’ before the accident, and is ‘absolutely mortified’ to be in a care home – but doctors say they do not know when she will be well enough to return home. “She’s in a wheelchair or in a bed, that’s all she can do now. She used to do her own shopping, walk to visit family, and wasn’t on any medication or anything before this,” said Lynne of Studfield Grove, Wadsley. Alterations costing thousands of pounds have already been made to Maureen’s home to accommodate her new mobility problems, and an occupational therapist is due to assess the property next week to see whether more will need to be made. Lynne says that after weeks of chasing South Yorkshire Police they confirmed this week that the case has been closed with no further action being taken against the driver of the mobility scooter. She said: “They said that it can’t be recorded as a road traffic collision, that it’s not classed as anything. Government guidelines state that there is no eyesight requirement to drive a mobility scooter and you also do not need a license or insurance to ride one – but the latter is recommended. Certain types of mobility scooters do need to be registered, however.